What Are the Five Major Exit Goals Around Which Co-Owners Need Alignment? Business co-owners need to create alignment around their individual exit goals in order to achieve collective success. Remember that aligned does not mean matching or identical. Different co-owners can have different exit goals, and this is usually the case. Alignment means one co-owner's goals cannot interfere with or undermine another co-owner's goals. 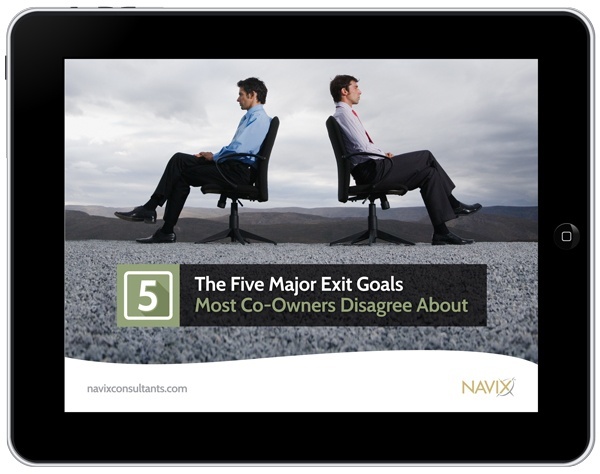 While it is possible to list dozens of potential goals that could be incompatible between two or more co-owners, there are Five Major Exit Goals that most owners pursue in their exit planning which have the greatest potential to be incompatible among business co-owners. The Five Major Exit Goals are Exit Strategy, Exit Timing, Exit Amount, Legacy and Transition. To learn more about each exit goal in our new eBook, please fill out the form below.